I've configured File Explorer to compress the vertical spacing in the Navigation pane, so that I can see more. This is a GREAT feature of Classic Shell. Is the spacing change tweak something you could reaffirm with Explorer at additional times? It would be helpful if you can pinpoint the action that triggers the problem. It could be navigation to a certain folder, or maybe launching some program. Also, opening a new Explorer window fixes it, right? Launching a new window does indeed fix it. I've yet to pinpoint what causes it. It always seems to happen when I'm not looking at the Explorer window. A few moments ago I completed an installation of an application and now I noticed the rows in my two open Explorer windows are widely spaced again. I'll keep looking for a direct cause. I figured out how to reproduce it reliably. One need only go into the Folder Options dialog and do most anything - e.g., press the [Clear] history button. Yes, this is caused by Classic Explorer. It will be fixed in the next version. Thank you, Ivo. Looking forward to trying out the next beta. What a shame that the "Windows XP Classic" style of Navigation pane is no longer possible in Windows 10 thanks to Microsoft. Every Windows release cripples some Classic Shell feature. 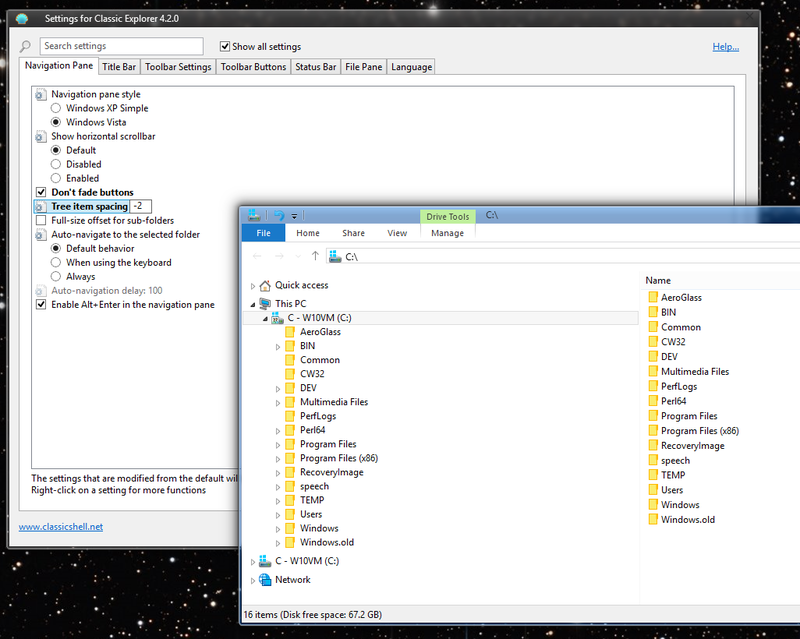 Update: About that Explorer folder tree corruption issue with the Navigation pane style set to "Windows XP Classic" I observed that if you set the "tree item spacing" to 4 or higher, the icons don't get corrupted even in 'Windows XP Classic' style. Well, it's hardly unexpected. Unused code (in the typical sense) is being removed all the time, so re-enabling dormant functionality will become less and less viable over time. Not that I agree that they should be doing so. But they are. Explorer needed a rewrite a looong time ago. Most people nowadays, sadly, seem too ignorant to understand how much better it could be. The bug is fixed in the latest version 4.2.1. Don't forget to change the download page so it says "Release" instead of "Beta". Edit: Sorry, make that the "History" page, not "download".